This chapter helps you to create your first Odoo module and deploy it in your Odoo.sh project. This tutorial requires you created a project on Odoo.sh, and you know your Github repository's URL. Basic use of Git and Github is explained. my_module is the name of the module. Replace these by the values of your choice. type feature-1 in the To input. Once the build created, you can access the editor and browse to the folder ~/src/user to access to the code of your development branch. While not necessary, scaffolding avoids the tedium of setting the basic Odoo module structure. You can scaffold a new module using the executable odoo-bin. If you do not want to bother installing Odoo on your computer, you can also download this module structure template in which you replace every occurrences of my_module to the name of your choice. Do not use special characters other than the underscore ( _ ) for your module name, not even an hyphen ( - ). This name is used for the Python classes of your module, and having classes name with special characters other than the underscore is not valid in Python. If you want to create your module structure manually, you can follow Build an Odoo module to understand the structure of a module and the content of each file. $ git commit -m "My first module"
The above command is explained in the section Commit & Push your changes of the Online Editor chapter. It includes the explanation regarding the fact you will be prompted to type your username and password, and what to do if you use the two-factor authentication. Your branch should appear in your development branches in your project. In the branches view of your project, you can click on your branch name in the left navigation panel to access its history. You can see here the changes you just pushed, including the comment you set. Once the database ready, you can access it by clicking the Connect button. 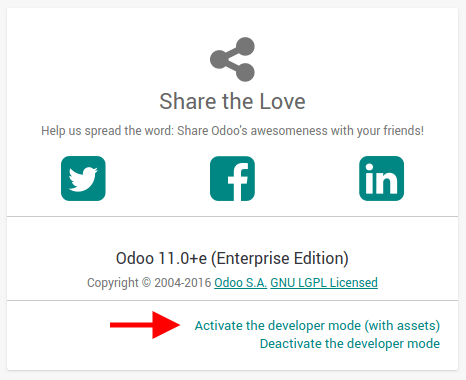 If your Odoo.sh project is configured to install your module automatically, you will directly see it amongst the database apps. Otherwise, it will be available in the apps to install. You can then play around with your module, create new records and test your features and buttons. You need to have a production database for this step. You can create it if you do not have it yet. Once you tested your module in a development build with the demo data and believe it is ready, you can test it with the production data using a staging branch. 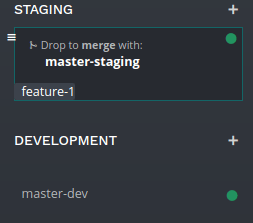 Make your development branch a staging branch, by drag and dropping it onto the staging section title. Merge it in an existing staging branch, by drag and dropping it onto the given staging branch. You can also use the git merge command to merge your branches. 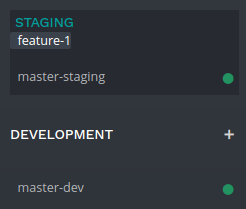 This will create a new staging build, which will duplicate the production database and make it run using a server updated with your latest changes of your branch. Once the database ready, you can access it using the Connect button. Your module will not be installed automatically, you have to install it from the apps menu. Indeed, the purpose of the staging build is to test the behavior of your changes as it would be on your production, and on your production you would not like your module to be installed automatically, but on demand. in the dialog that appears, click the Update button. Your module will then appear in the list of available apps. 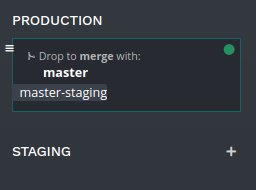 Once you tested your module in a staging branch with your production data, and believe it is ready for production, you can merge your branch in the production branch. Drag and drop your staging branch on the production branch. This will merge the latest changes of your staging branch in the production branch, and update your production server with these latest changes. Your module will not be installed automatically, you have to install it manually as explained in the above section about installing your module in staging databases. This section explains how to add a change in your module by adding a new field in a model and deploy it. then, open the file models/models.py. Then, open the file views/views.xml. These changes alter the database structure by adding a column in a table, and modify a view stored in database. In order to be applied in existing databases, such as your production database, these changes requires the module to be updated. If you would like the update to be performed automatically by the Odoo.sh platform when you push your changes, increase your module version in its manifest. Open the module manifest __manifest__.py. The platform will detect the change of version and trigger the update of the module upon the new revision deployment. Browse to your Git folder. $ git commit -m "[ADD] my_module: add the start_datetime field to the model my_module.my_module"
The platform will then create a new build for the branch feature-1. 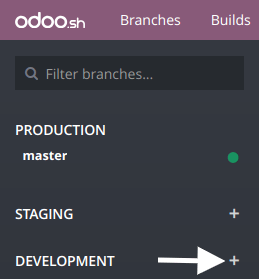 Once you tested your changes, you can merge your changes in the production branch, for instance by drag-and-dropping the branch on the production branch in the Odoo.sh interface. As you increased the module version in the manifest, the platform will update the module automatically and your new field will be directly available. Otherwise you can manually update the module within the apps list. If you would like to use an external Python library which is not installed by default, you can define a requirements.txt file listing the external libraries your modules depends on. The platform will use this file to automatically install the Python libraries your project needs. The feature is explained in this section by using the Unidecode library in your module. From the Odoo.sh editor, create and open the file ~/src/user/requirements.txt. Or, from your computer, create and open the file ~/src/odoo-addons/requirements.txt. Then use the library in your module, for instance to remove any special characters in the name field of your model. 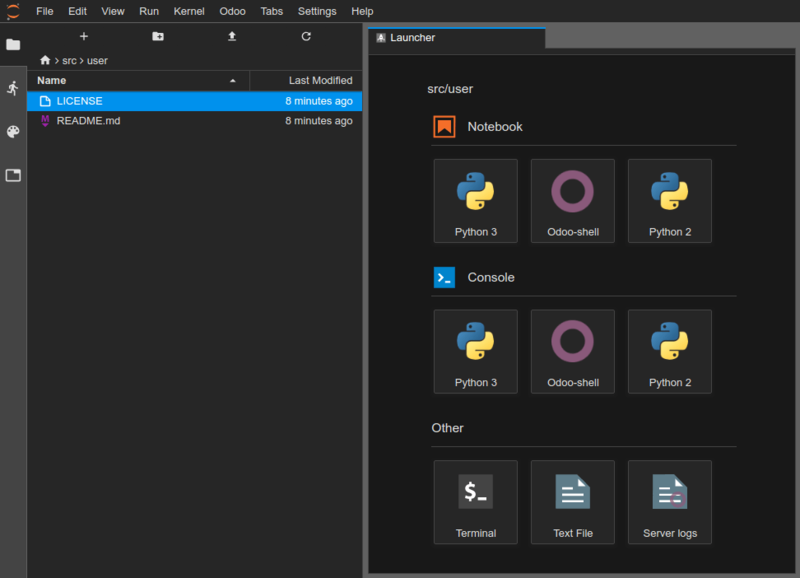 Adding a Python dependency requires a module version increase for the platform to install it. $ git commit -m "[IMP] my_module: automatically remove special chars in my_module.my_module name field"